This lamp runs on a very different type of power source: your blood. Mike Thompson, an English designer based in The Netherlands, has invented a light source than runs on human blood. 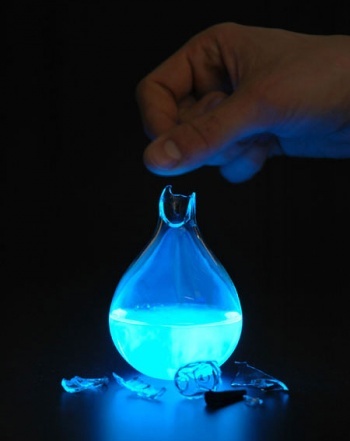 After mixing in an activating powder, simply smash the blood lamp's top end on a table, cut yourself open, drip some of your blood in, and watch it glow in a wonderful blue hue. It may seem like Thompson is trying to cash-in on the Twilight craze, but his intentions were much more creative and noble than that. He was researching chemical energy and happened to learn about luminol, a chemical often used in forensics to find blood at a crime scene. Luminol glows bright blue when mixed with the iron in red blood cells. Thompson thought: "if energy somehow came at a cost to us, then maybe it would make us think differently about the way we use it." The blood lamp is pretty awesome, but unfortunately it can only be used once. Not only must you bleed to light it up, you have to carefully choose when to bleed. Thompson really thought out this whole statement on the usage of energy, didn't he? There is video of the blood lamp in action up on LiveScience, showing just how it works, just make sure you don't mind seeing someone bleed a little before watching.